The MasterCase H500M delivers form and function you can raise your glass to. Four panels of tempered glass offer a comprehensive system view, complimented by two 200mm addressable RGB fans. Cycling of lighting colours and modes is made possible by an addressable RGB controller. Both the front mesh panel and glass panel accessory are included to offer a choice between maximum airflow and aesthetics. Each of the front panel options compliment the industrial design of the H500M in their own way. The covers on the frame and PSU shroud offer extra customization while keeping builds clean from cables. The top panel is compatible with two optional 200mm fans accompanied by a 360mm radiator to ensure a range of options for cooling high performance components. Features • Mesh & Glass Options Included: Choose between the mesh front panel for optimized airflow or the glass option for a balance of aesthetics and performance with the included accessory. • Four Tempered Glass Panels: Edge-to-edge glass side panels on both sides, a glass top panel, and a glass front panel offer a clear and comprehensive system view. • Two 200mm Addressable RGB Fans & Controller: Move air stylishly and quietly with two addressable RGB Fans controlled by an included addressable RGB controller. • Rich Connectivity: The I/O panel comes with a USB 3.1 (Gen 2) Type-C port, and four additional USB 3.0 ports. The included addressable RGB controller manages the lighting of the system. • Covers For Clean Building: A total of 9 covers take clean building to the next level with a PSU cut out cover that provides the option of showing off your PSU or leaving it out of sight. • Show Off Your Graphics Card: Two additional PCI slots at the rear enable you to show off your graphics cards in the vertical position. • Adjustable GFX Support Arm: Relieve the stress of weight and reinforce larger, longer graphics cards with an included adjustable graphics card support arm. • 200mm Radiator Support: The front panel is compatible with up to a 360mm radiator, including support for one 200mm sized radiator. The top bracket supports up to a 360mm radiator along with 200mm fans. 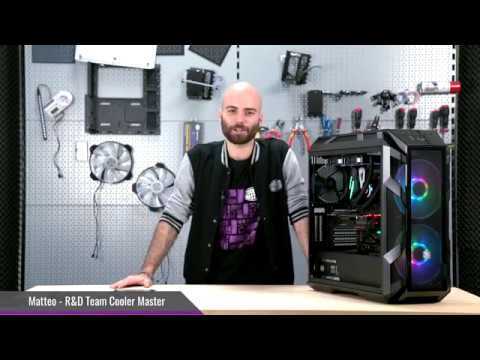 Cooler Master MasterCase H500M Mid Tower PC Case, w/ Tempered Glass Windows, E-ATX~mITX, 2x 200mm Addressable RGB Fans is rated 4.7 out of 5 by 3. Rated 5 out of 5 by cerig from my new pc i do not do review so i will keep it short. the unit was a made to order pc and scan followed my choices exactly. the unit was so well packd for delivery they could have dropped it off by helicopter. Rated 4 out of 5 by DaveS from Great case, almost perfect The case itself is well built and it's easy for a novice to take apart and tinker with. There are a few "quality of life" additions like behind motherboard SSD holders and a GPU support arm. My only issues with the case are that the back of the case is also glass, so unless you're only using a few wires, which I'm not, then seeing the wires through the glass is inevitable. I also bought some Thermaltake 200mm TT RGB fans to replace the ones that came with the case so they matched all the others inside. They didn't fit. The holes for the fans don't line up. I'm not sure if that's an issue on Thermaltakes side or Coolermasters, but be warned that not every 200mm fan will fit this case. Seen as both of those are personal choices I would still recommend this case to others as the fans that came with it are quiet and seem sturdy enough and the general appearance of the case is slick.